Liven up your cosmetics store using Imagus theme. It has a convenient interface and a stylish design, which will help you engage more visitors and potential customers. You will be able to display products by categories, add information about sales and special offers, and also inform about your team and contacts. It will be easily and quickly to customize your eCommerce website according to your needs and taste using a powerful Jet plugins bundle for Elementor page builder. JetWooBuilder plugin will be your perfect asset in creating WooCommerce page templates using loads of special widgets and stylish page layouts. With JetProductGallery plugin you will be able to show images of the products in the form of an intuitive gallery without any coding knowledge. Using JetCompareWishlist plugin you will add comparison and wishlist functionality to the product pages. You will add AJAX filters to the pages with the help of JetSmartFilters plugin. 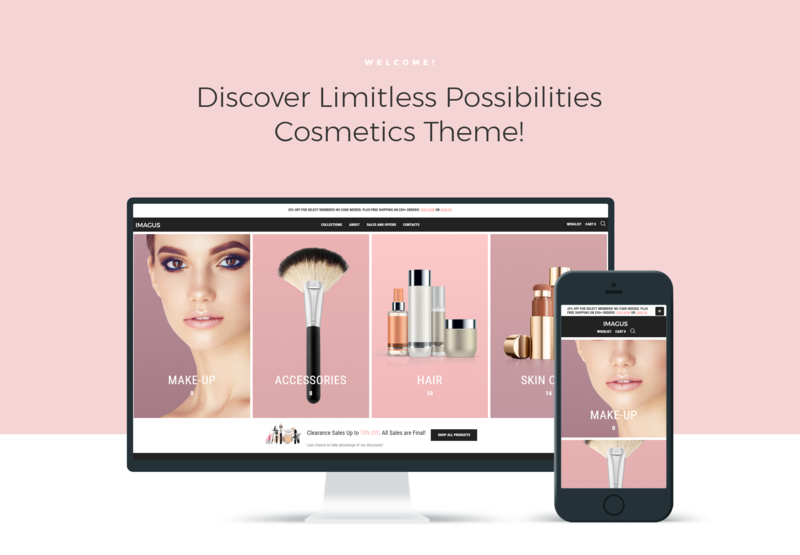 Your cosmetics shop will become modern and professional with a responsive Imagus theme.